It is the most frequent question I get asked: how can I get a job in the NBA? My advice, based on lessons from my story and experience working for teams. My first day in Portland was a whirlwind. I had moved out to the Pacific Northwest to start full-time work for the Blazers right after I graduated from college, so it was at the beginning of June, with less than a month until the draft, that I walked into the office and was given a tour of the practice facility. The building wasn’t that large, and in a short period of time it would become as familiar to me as my own home — but on that first day it was a labyrinth. The new coworkers who would soon become close friends were a blur of welcoming faces. There was no way I was going to remember all of these names, I thought. But one meeting I will never forget. I rounded the last corner, and there, at the end of the hallway, was Kaleb Canales, one of the Blazers’ assistant coaches. “Benny!” he yelled, and ran up to give me a big hug. I had never met him before. “Who is this guy?” I thought. Turned out: it was Kaleb. That’s just who Kaleb is: one of the warmest, most genuine, personable people you’ll ever run into. His tenaciousness, work ethic, and ability to connect with players was incredible to witness firsthand. When Kaleb was a teenager, he set a goal for himself of becoming an NBA head coach by the age of 35. Growing up in Laredo, Texas, with no high-level basketball connections, he might as well have dreamed of going to the moon. But through the sheer force of those personality traits, and with a dash of luck, he not only made it to the NBA — he actually achieved his goal. He got the college job largely because of the impression he made as a team manager several years before while pursuing his bachelor’s degree. And he earned that position because of the impression he made while visiting best friend Hecky Noyola, then a redshirt freshman with the Mavericks. It wasn’t, of course, the fact that Kaleb inundated Spoelstra with letters that made the mark. It was what was behind the letters, what was contained in them and what they represented — the relentless positivity, the unwavering faith, the refusal to take no for an answer — that made the Heat consider going against their team policy of promoting from within. Ultimately they decided to stick with that policy, but Spoelstra was so impressed that he called around to other teams and told them they needed to give this guy a shot. The Blazers were the first team smart enough to take Spoelstra up on that recommendation, and offered Kaleb an unpaid internship. He didn’t even have to think about his answer. The money didn’t matter. If it took subsisting on tuna and graham crackers to make this work, he would. He had ahold of his dream by the tail — no matter how much it thrashed, he wasn’t letting go. He worked so hard poring over film and refining edits that most nights he slept at the practice facility on the couch in the player’s lounge. When the players would come in late at night to shoot around, Kaleb would be jolted awake by the pop of the lock on the doors as the players swiped in, and would spring up and run out to the court to rebound for them. Kaleb’s story is one that so many people believe could be theirs, if only they were given the chance. But Kaleb is the exception of exceptions. They don’t make many people like Kaleb Canales. For most, the dream of working in the NBA slams headfirst into the cold, hard reality of math: there are only 30 teams, with only a handful of entry-level basketball operations jobs at each team — and thousands of people looking for a way in. Those numbers determine much of how NBA front office employment works. Teams have relatively small staffs, with limited time. Filtering the bottomless stack of resumes they get for any one job is not an easy task, and not necessarily a priority. In that situation, teams rely on information that makes it easier for them to winnow the field: connections, recommendations, playing experience. That’s also why these jobs pay as little as possible. It’s simple supply and demand: if so many people want something that is this scarce, they compete in any way possible to get it, including lowering their wage demands as much as they can (even to zero). Meanwhile, the mass of candidates is mostly interchangeable to teams, so why would they pay more for one person over another? This is the first thing you need to understand if you want a job in the NBA. The math is the math, and you can’t change that. Ultimately, you need a healthy dose of luck to get to where you want to go. But there are some ways to shift the odds in your favor. Luck is exactly how I got my start in the NBA. The path I followed was not of my own design, nor was there any point along the journey that I actually thought it was likely to work out. In many ways, my story is just about being in the right place at the right time. There’s a chapter in Malcolm Gladwell’s book, Outliers, that I think captures my story well. It discusses a list of the 75 richest people in history. Gladwell writes that “an astonishing 14 [of the 75] are Americans born within nine years of one another in the mid-19th century.” They amassed their great wealth because they came of age during a unique time in history: as America reaped the gains of the Industrial Revolution and the government took a hands-off approach to concentrated wealth. The Rockefellers and Carnegies were exceptional for their time — but their time was more exceptional. They were running on a moving walkway. Their speed was more about the context than anything innate. I was just like these outliers: I was the right age, with the right interests, at the exact time when data was transforming our world and unlocking doors that were previously bolted shut. Many had come before me and yanked with all their might on that door, and it wouldn’t budge. Many have come after me, trying to squeeze through a doorway that’s jammed with bodies. Unknowingly, I happened upon that door just after the bolt had been loosened. There wasn’t much special involved in turning the knob and swinging it open. There are some things that can be learned from my story, however. It started in high school, when I was invited to play in a fantasy basketball league that someone had created themselves. Nothing like it existed, they made up the rules, so they couldn’t use ESPN or Yahoo. They had to make their own website for it. When I saw that, a lightbulb went on in my head. You could do that? Make your own game that easily? Fantasy basketball was always my worst fantasy sport. I was pretty good at fantasy football and fantasy baseball, but when it came to fantasy basketball I’d try too hard to build real teams and acquire underappreciated role players instead of going for the stars pouring in empty points — a winning recipe in the NBA, but certainly not in the world of fantasy. But now, I thought, I could actually build the game I was trying to play. I could try to make a fantasy league that simulated what it was like to be an NBA GM. To do that, though, required learning how to make a website. This was 2002 — the Web was not nearly as mature as it is today, but resources still existed to learn how to do that for free. And so I read, and tinkered, and experimented, and figured out how to make what I wanted using HTML. I found 19 other people willing to play with me, and my fantasy league was born. But I wasn’t done. Over the years I kept pushing to make the game more realistic and give the website more features. To do that I had to learn more programming: how to set up a database2, how to write scripts that could communicate between the web page and the database3, how to gather data and store it and display it. Unwittingly, I was building up the skillset that I would need to help a real NBA front office. In the process of trying to make my game more realistic, I stumbled upon a basketball statistics mailing list. But this wasn’t just a random group of fans — this was the APBRmetrics mailing list, where the leaders of the emerging field of basketball analytics participated. Dean Oliver. John Hollinger. Kevin Pelton. Roland Beech. The pioneers of the field, discussing their thoughts in the open. I read everything I could, and then began to ask questions. Eventually, as I gained more knowledge and confidence and data, I started to participate. By the time I was a freshman in college, I was able to do real analysis with the data I had collected. And that was when I got my break. Dean Oliver, by this time the Director of Analytics for the Denver Nuggets, posted on the APBRmetrics board that he was looking for summer interns. As soon as I saw that post, I messaged him something to the effect of: “I’ll be your intern!” He wrote back that he didn’t have any budget to pay me, but that he’d love for me to work on a project of my own choosing. I immediately agreed. I would work remotely for Dean, doing whatever projects we could come up with. The summer went by in a flash. I learned an immense amount in just a few short months, and when it was time to go back to school I didn’t want to lose the opportunity. So when Dean mentioned that we could talk about doing something like this next summer, I redirected him: I’ll keep working during the school year, I said. And that’s what I did, breaking down film and crunching numbers for the next year. Multiple times in 2008 it looked like I might latch on with another team in a more secure capacity, briefly corresponding with both the Raptors and the Warriors about a potential position. But neither team seemed particularly serious, so nothing materialized. In the fall of 2008, the beginning of my junior year, the Blazers called Dean looking for someone to do part-time analytics work. He gave them my name, and the next day they called me. Unlike the other teams, they were serious. By the end of the conversation, I had been offered a part-time position with Portland4. I would work remotely and give them as many hours as I felt I could around my schoolwork. And that’s what I did, averaging about 80 hours per month during the school year and working full-time during the summer. It was a lot of time, but it wasn’t difficult. This was my hobby! If I didn’t have this job I probably would have been spending a good portion of my time doing something like this anyway. Shortly before I graduated, the Blazers agreed to hire me in a full-time capacity. A few days after wearing my cap and gown in the spring of 2010, I was on a plane out to Portland. Every story is unique. No path can be followed twice. Times change, dynamics change. What worked before is not guaranteed to work again. But there are some broad lessons that can be drawn from my story and Kaleb’s story, lessons that can tilt the odds in your favor. From your perspective, you are distinctive and valuable. But teams can’t see that. Put yourself in their shoes: they get thousands of applications every year, hundreds of cold-emails asking for jobs, and dozens of recommendations from people in the industry they know — all for one or two or three open positions. How can they tell who is good? How can they tell who can really help them? 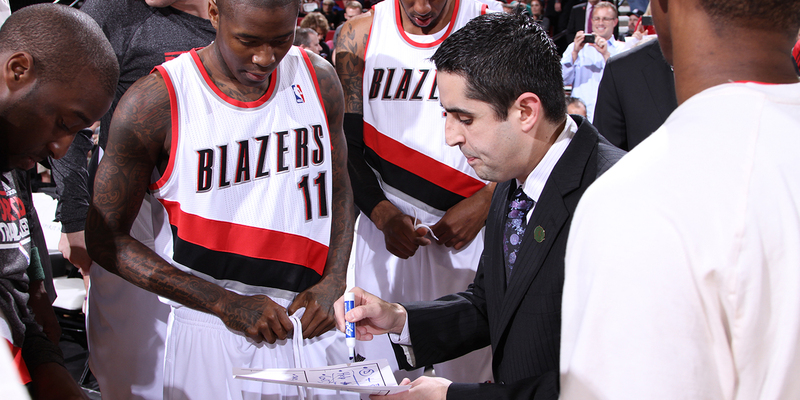 In my case, I was able to program, to collect and analyze and display data in ways that helped the Blazers. In Kaleb’s case, his remarkable personality shined through in his persistent letter-writing. These distinguished us. If you have something that sets you apart, your goal should be to get in front of the appropriate person in the front office and make that case. Usually this is not one of the highest ranking executives, but someone a little lower down on the totem pole who has the time to respond to these types of inquiries. Dig up their email address. Be succinct, humble, and clear. Respect that their time is very limited. Don’t ask for time on the phone, but rather ask specific questions that will garner brief but helpful answers. The key part of that email is the example of work. Again, remember that NBA teams don’t know what you can do or why it helps them. You have to show them, making it as easy as possible for them to see. And how do you do that? By doing the job before you have the job. Act like you have the job you want, imagine what the work would be like — and then do it. Put together unique scouting edits on D-League players. Build advanced spreadsheets or websites with salary cap info and helpful ways to visualize details of contracts. Analyze data to help answer a question the coaching staff might have, like the value of a 2-for-1. Taking initiative like this does a few things. First, it shows them clearly what you can do, because you’ve already done it. Second, it demonstrates an ability to be a self-starter. Third, it teaches you — you are gaining experience in your desired field before you even step through the door. Lastly, it gives you the opportunity to get feedback and to learn from others: if what you’ve done isn’t good enough for teams to immediately be interested, you can find out why. Maybe this sounds straightforward, but the vast majority of people who got in touch with me while I was with teams looking for a job didn’t have anything to show me. And if I asked for a project, many wouldn’t follow up. I don’t want to ignore the fact that this kind of approach can be difficult depending on what else is going on in a person’s life — finding time or energy to work around another job, family responsibilities, or other issues can be a challenge. But that’s just the reality of how competitive this space is. You have to channel your inner Kaleb. One way to do the job before you have the job: aim lower at first. Try to do this work for a D-League team, or a small college program. It’s less glamorous and a longer path, but the jobs are less competitive, and it can pay off by letting you hone your craft, adding valuable lines to your resume, and developing connections. When the door opens a crack, jam your foot in and don’t let them close it on you no matter how much it hurts. That’s something both Kaleb and I did: work for free if you need to. Keep learning and demonstrating value. Prove they need you. This is a controversial point, particularly within the analytics community. Some feel they are being taken advantage of by teams who won’t pay anywhere near the rates that other industries will for their skill sets. Or they don’t want to give away their work for free. But most NBA teams are not aiming to exploit — they, like the rest of the business world, are simply behaving in accordance with the economics of the situation. There are non-monetary perks involved in working for a team: namely, being part of a front office. You can watch practice! Sit in the draft room! Brush elbows with the players! The only other way to do that on a regular basis is to buy a team. If this matters to you, you’re getting paid in a way other than salary. That doesn’t mean you should be afraid to negotiate when the time comes. But that time is usually not on the way in. As noted before, the nature of entry-level positions is that teams are not willing to pay for them because of the supply/demand imbalance. But once you’ve gotten in, it swings the other way. Now you’ve proven your worth, and are one of a small minority who has the right connections and right experience doing this work for an NBA team. People like that are in short supply, which is why the salary curve for NBA employees accelerates rapidly. So don’t worry about the money early on. If you stick in the league, that will take care of itself. Show a team you can really help them, and they’ll be more than willing to pay you — if for no other reason than to keep you away from a competitor. The NBA life is not for everyone. You have to truly love the work, every day. Because when you’re starting out, the pay is not great, the hours are rough, and organizations sometimes have frustrating workplace dynamics. The value of actually working for an NBA team has to outweigh all of that. If it does, then following this advice can help increase your chances of living that dream. I’ve given this advice to many people, and been surprised at how few followed up on it. There are several who did, though, and have jobs with NBA teams now. It can work. The odds are still against it — but low odds are not zero. Just ask a certain coach from Laredo.